For thermoplastic printing on a 3D printer, it’s a good idea to have two or more extruders of the same type, but with different nozzle sizes and maybe a choice of 3mm or 1.75mm filament. Some materials — especially experimental materials — tend to come in 3mm and less often in 1.75mm. Depending on the manufacturer, 3mm filament may cost less than 1.75mm filament. Having a choice of nozzle sizes is great if you intend to print parts of varying quality. Although you can always print with a small nozzle, the print job may take a lot longer for certain parts. Using a bigger nozzle can be handy if you want to create rough drafts of your models or intend to finish the resulting object with paints or fillers. A good all-around nozzle size is 0.4mm, which allows for fine detail and a reasonable print time for most parts. You can also select layer heights of 0.3mm or lower. This isn’t to say that a big nozzle can’t provide high quality. You can select very low layer heights if you’re using a big nozzle, which makes the vertical quality of a print almost identical to what you’d get with a small nozzle, though some fine horizontal details may be lost if the model has many sharp corners and features. Think of a 3D-printing nozzle as being similar to a paintbrush. You can use a small brush or nozzle for finer details and sharper edges; a big brush or nozzle “paints” faster but can’t resolve intricate details clearly. A typical large nozzle for a home 3D printer is 0.6mm or 0.8mm. A 0.6mm nozzle allows you to print layers of 0.5mm or lower and usually gives you a much faster print time than smaller nozzles. Some large RepRap printers use 1.2mm nozzles to produce models a meter (or more) tall or wide in size. Don’t set a layer height that exceeds the size of the nozzle. Keep the layer smaller than the nozzle to ensure good bonding of plastic layer on layer. You can try using as small a nozzle as your machine mechanics allow. Keep in mind, however, that normal minimum layer heights are around 0.1mm (100 microns) — about the thickness of a sheet of office paper. Most RepRap machines allow layers of 0.05mm (50 microns) and even smaller, but printing time increases dramatically, and the extra quality is hard to distinguish. Common layer heights are 0.2mm or 0.25mm, which produce a highly presentable surface. As you become more accustomed to 3D printing and tune your printer to run faster, you’ll find pleasing resolution at layer heights around 0.15mm or 0.1mm. If you decide to keep more than one extruder available for your 3D printer, you don’t need to fit all the extruders on your machine at the same time. In many situations, having a quick-fit mechanism that allows you to change extruders easily makes sense. Richard struggled with multiple extruders when some of the first RepRap machines were being developed. At the time, all extruders were mounted permanently on the moving X-axis carriage with nuts and bolts. Changing extruders was time-consuming and tricky, and users couldn’t even think about having more than one type of extruder. Richard developed a quick-fit carriage and various extruder bases for the most common hot-ends and paste extruders. The idea was to allow experimentation and make extruders easy to change and lock into place on RepRap printers. A replacement X carriage compatible with many RepRap 3D printers. 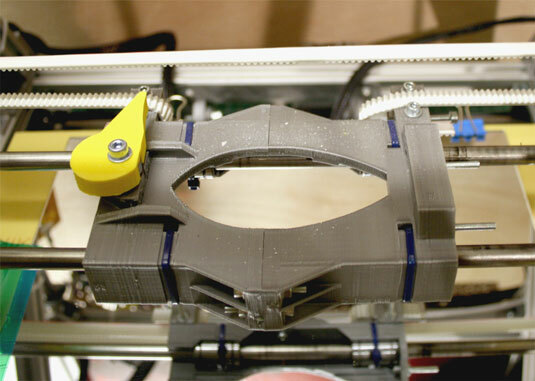 The yellow lever at left allows the quick fitting and removal of extruders.